adventure time anime. . Wallpaper and background images in the Adventure Time With Finn and Jake club tagged: jake adventure time finn cartoon anime. This Adventure Time With Finn and Jake photo might contain sign, poster, text, and chalkboard. love the backround!!!!!! 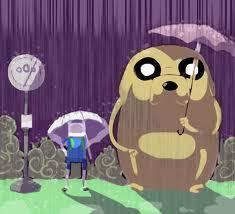 Jake is so cute!!! I <3 MY NEIGHBOR TOTORO!!!! !